The hashed green lines indicate Restricted Areas to the Public. These are marked with Restricted designations. The gray lines are Military Operating Areas (MOAs) and actually cover most of Southern and Central Nevada. The Actual Restricted Areas cover an area the size of Connecticut. The MOAs are open to civilian air traffic with some restrictions. R-4806W - is Part of Nellis Gunnery & Bombing Range incorporating Range 61, 62 and 63. Indian Springs is right on the border of Range 63. R-4807B - is Area 19 of the Department of Energy and Department of Defense. Home of the now famous disappearing high voltage cables from a lone pylon in the middle of a circular road. Presumed area for 'Cheshire Airstrip' (apparently) Area 19 seems to be one of the best kept secrets of the Ranges, miles from any road, it cannot be seen by the public except when on an overflight of R-4807. DoE will not say what is here, and refuses to let Press Tours go here making excuses like 'roads are not maintained' When in actual fact the roads are very well maintained! The Restricted area above Area 19 is part of R-4807A Now open to Public Flying on Certain Sundays of the Year. All flying is of course strictly monitored and you are under constant control of Nellis AFB. Do Not stray or answer back to the controller, they have the right to make you turn around immediately and also instruct you to land. R-4807A extends from this area, above A19 all the way to the Western Edge of the Ranges at Hwy 95. The Restricted Area 4807A also extends Southwards to Beatty Area. This is the Largest Restricted Area in the Nellis Ranges and incorporates Tolicha Peak ECR and Quartzite Mountain bombing Range. Several Giant bullseyes are marked around the area indicating some large weapons were dropped by B52s and Earlier Aircraft. R-4807A also surrounds R-4809(Tonopah) on both sides East and West. 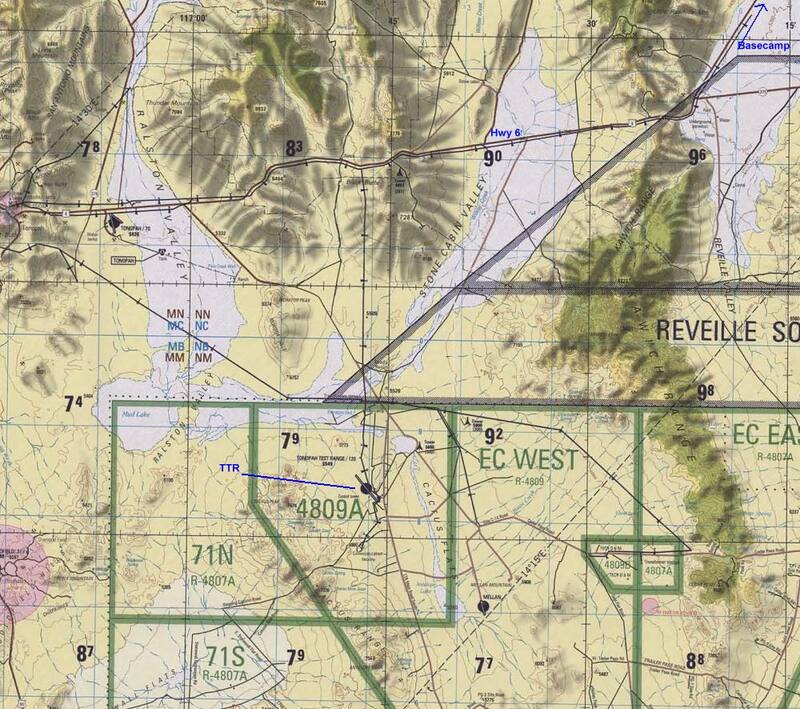 R-4808N (South) - is the Nevada Test Site (NTS) incorporating Frenchman Flat, Yucca Flat, Rainier Mesa and Pahute Mesa. Owned by the DoE Several airstrips are dotted about the NTS all private and restricted. One such airstrip is located right on the Yucca Flat and is of course a desert unpaved strip being on the flat, as it doesn't need hard surfaces due to the compact sand/salt. One is also located at Pahute Mesa further to the North west near Area 19 this time being a Paved Surface. R-4808N (North East) - Groom Lake Restricted Area. 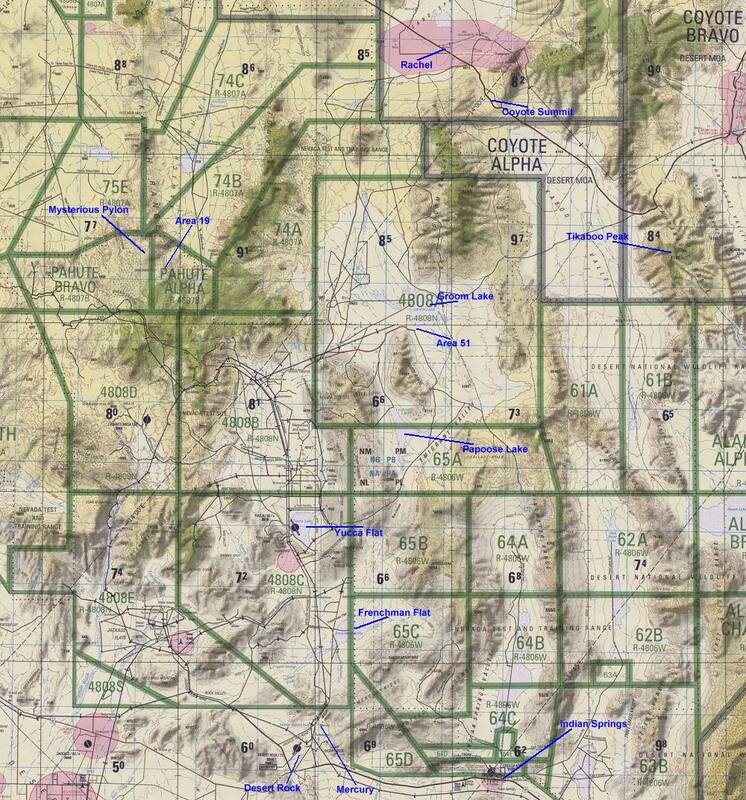 Beyond Papoose Mountain Range(the mountains in-between Papoose and Groom) is a complete no - go - area for Nellis Pilots. Although Papoose is still part of the Nellis Gunnery and Bombing Range was until recently full of targets of which Nellis Aircraft used to Bomb and Strafe, which could very well rule our the Bob Lazaar Story. More on S-4 on the other pages. This North East Sector is co-owned by the DoE and AFFTC of Edwards AFB. R-4809 - is Tonopah Test Ranges and Site-4. This Restricted Area extends southwards to border with R-4807A which in turn borders with Area 19 also. Tonopah Test Range is clearly in view here at the bottom of the chart with its runway pointing approximately 345 degrees North. The Test Range is situated on Cactus Flat. Either side East and West is part of R-4807A which i mentioned earlier being open to the Public for flying on some Sundays. Looking North, just outside the scope of the map, is BaseCamp. The Airfield is marked as "Abandonned", but is still very much active. The strip has been re-paved fairly recently, and is closely guarded by armed security. Further on up north of Basecamp is Ground Zero and Lunar Crater. MOAs or Military Operating Areas, marked here with gray lines, cover a huge percentage of California and Nevada. They are primarily used by military aircraft for various exercises. MOAs are open to the Public on the ground and in the air. Most MOAs around Nevada afford good views of Aircraft dogfighting and doing general handling at low level and medium to High level. The MOAs situated the North and East of Area 51 are where a lot of sightings have occurred of Black Projects. But as the MOAs extend for hundreds of miles, chances are slim of spotting a Black Project. The MOAs surrounding the Ranges are the Desert MOA (East) and Reveille MOA (North). Desert MOA also includes the Area adjoining Restricted Area for Groom lake R-4808A and includes Rachel, Tikaboo, all the way over east to Caliente. Multiple Sonic Booms blast this Caliente Area given off by Fast Jets and B1Bs at Low Level. Occasionally the booms even cause minor damage to residents' homes. Further north from the Reveille MOA are the MOAs used by Both Nellis and Fallon NAS. There is an exciting looking MOA in this area called Austin 1 and 2 MOAs, in amongst these MOAs is a Valley that follows the road from Eureka to Reno(Fallon) and is very tight turns. Pilots use this to train in steep valleys. This being an ideal one. MOAs to the west of the NTS are also 'pickings' for Black Projects. These extend and cover the whole of Death Valley(Panamint MOA) All the way up and into California to Bishop area (Saline MOA). Panamint MOA is immediately to the East of China Lake and covers half of the North of China, while the other half of the north is covered by the Owens MOA. To the East of Death Valley to West of highway 95 in Nevada is the Shoshone MOA and Silver MOA. In California Edwards AFB has extensive MOAs allocated to it for trials and testing aircraft. These Ranges extend upto China Lake and way out to the East and North West.